A post dedicated to our sponsors and readers for their support with our blog Design Chair. Since we launched our blog section for Design Chair we keep getting great positive feedback from our readers so we would like to say thank you and watch this space for more great content. 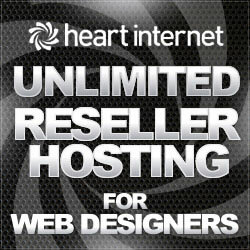 A special thank you to our Sponsor, Heart Internet’s which is a Reseller Professional account is every Internet professional’s dream. Specially tailored for web designers, Internet integrators, web hosting resellers and developers, their Reseller package includes unlimited web space, unlimited bandwidth and the ability to host unlimited domains at no extra charge! To become one of our sponsors its pretty simple and can be done via our buy and sell ads page which gives you more detail on sponsors/advert spots available on Design Chair. The perks of becoming one of our sponsors are that you will be featured on two sites for the price of one. To check our latest sponsors and the valuable services which they offer its really simple all you need do is click our sponsor spots in the sidebar of the site.